There’s no shortage of superheroes at San Diego Comic-Con. But this afternoon is all about the villains as the team behind DC’s newest videogame, LEGO DC Super-Villains, takes the stage to give attendees their first good look at the gameplay. Fans should expect the unexpected—we are dealing with super-villains, after all—and to come away knowing what it’s like to walk on the bad side of the bricks. However, if you’re not at SDCC, don’t worry. We’re still giving you a chance to get in on the action. 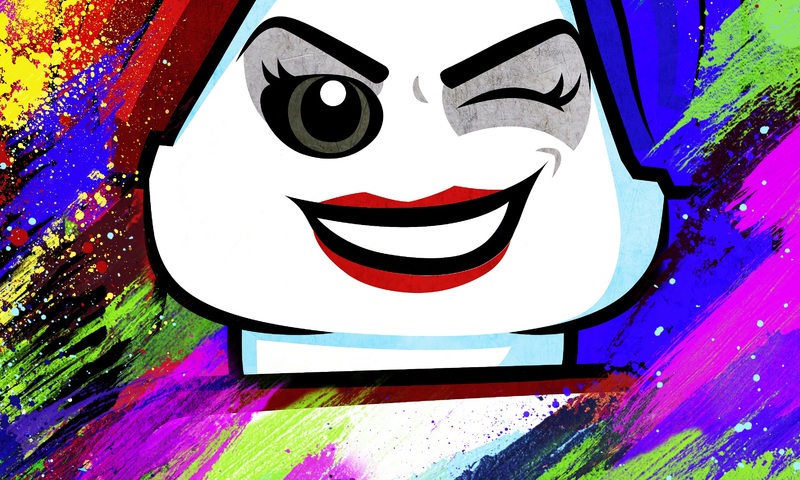 You can win two—that’s right, two—LEGO DC Super-Villains posters signed by Kevin Conroy (Batman), Tara Strong (Harley Quinn) and TT Games’ Head of Design Arthur Parsons. Don’t worry, unlike most things having to do with LEGO DC Super-Villains, this is on the up-and-up. All you need is a Twitter account. Retweet our LEGO DC Super-Villains poster giveaway tweet here--you’ll have until 4:29 PM PT on Saturday, 7/21 to retweet it. After the 24-hour entry period, we’ll pick five winners at random and DM them for their info. Reply to us and you get two new posters to spruce up your hideout. Seriously, is this the easiest score you’ve ever been a part of or what? See below for the full terms and conditions, and remember, in the world of LEGO, anyone can build an empire. 2. SPONSOR: DC Entertainment, 2900 W. Alameda Avenue, Burbank, California 91505. “Sponsor and its agents” shall mean DC Entertainment, its advertising/promotional and/or fulfillment agencies and their respective parent companies, affiliates, subsidiaries and their respective employees, officers, directors and agents. 3. ELIGIBILITY: This Sweepstakes is (1) open to legal residents in the 50 United States and the District of Columbia who are 18 years of age or older and have Internet access; (2) void in Puerto Rico, the U.S. Virgin Islands, U.S. Military installations in foreign countries, all other U.S. territories and possessions and wherever prohibited or restricted by law; and (3) subject to all applicable federal, state and local laws. Entrants who are not of the age of majority in their state of residence (“Minor”) must have their parents’ or legal guardians’ (“Parent”) consent to participate in the Sweepstakes and such entry will be deemed to have been submitted by the Parent. Employees and consultants of DC Entertainment, Warner Bros. Entertainment Inc. and each of their respective affiliates, subsidiaries, divisions, and advertising and promotional agencies, prize suppliers and their respective officers, directors and agents (collectively, the “Sweepstakes Entities”) and the immediate family members and persons living in the same household of each are not eligible to enter or win. 4. HOW TO ENTER: This Sweepstakes begins 7/20/2018 at 4:30 p.m. PT and ends on 7/21/2018 at 4:29 p.m. PT. (the “Sweepstakes Period”). Sponsor’s computer is the official timekeeping device for the Sweepstakes. To enter the Sweepstakes, during the Promotion Period, go to https://twitter.com/dccomics (“Website”); follow the @DCComics account and retweet the official DC Comics tweet announcing the sweepstakes (the “Submission”). Follow the Twitter account @DCComics and retweet the official DC Comics tweet announcing the sweepstake to receive one entry into the Sweepstakes (collectively an “Entry” or “Entries”). If you do not have an account on Twitter, you must create one by following instructions on Twitter.com. Creating an account is free. Entrants agree that by submitting an Entry, entrant agrees, understands and complies with these Official Rules. Limit one (1) Entry PER PERSON. If more than one such Entry is submitted in a calendar day only the first such Entry submitted will be accepted. Any attempt by an entrant to obtain more than the allowable entries by using multiple/different e-mail addresses, accounts, identities or any other methods will void all of that participant’s entries. Illegible and/or incomplete Entries and Entries submitted by entrants who do not meet the eligibility requirements (including all requirements with respect to age and residence) are void. Sponsor and its agents are not responsible for lost, late, or misdirected Entries, for technical, hardware or software failures of any kind, for lost or unavailable network connections, or for failed, incomplete, garbled or delayed computer transmissions or any human error which may occur in the receipt or processing of the Entries. Proof of submission of entry at Website does not constitute proof of delivery or receipt. Sponsor reserves the right to modify the scheduling of the Sweepstakes without prior notification. Use of computer programs, macro, programmed, robotic, automatic and other similar means to enter the Sweepstakes is prohibited and may result in the disqualification of the entrant. In the event of any dispute concerning the identity of any entrant, the Entry will be deemed submitted by the natural person who is the authorized account holder of the transmitting email address used to participate in the Sweepstakes. “Authorized account holder” is defined as the natural person who is assigned to an email address by an Internet access provider, online service provider, or other organization (e.g. business, educational institution, etc.) that is responsible for assigning email addresses for the domain associated with the submitted email address. If a dispute regarding the entrant’s identity cannot be resolved by Sponsor, the Entry will be deemed ineligible. All Entries become the sole property of the Sponsor and will not be acknowledged or returned. 5. POTENTIAL WINNER SELECTION AND NOTIFICATION: A potential winner will be selected at random from among all eligible Entries received drawing on or about 7/21/2018 by Sponsor or its designee, whose decisions are final and binding on all matters relating to the Sweepstakes (“Potential Winner”). Entrants need not be present to win. Potential Winner (or Parent if a Potential Winner is a Minor) will be notified by e-mail (“Prize Notification”) and must provide by e-mail within five (5) calendar days of the date of the Prize Notification (the “Deadline”), with his/her full name, mailing address (no P.O. Boxes) and any additional information (“Information”) requested by Sponsor. If a Potential Winner does not provide the Information in response to the Prize Notification by the Deadline, he/she will be disqualified and an alternate Potential Winner may be selected by Sponsor in a random drawing from all remaining eligible entries received for the original drawing, if time permits. Once Sponsor receives Potential Winner’s Information and, if required by Sponsor, a completed and signed affidavit of eligibility and liability/publicity release and any other forms required by Sponsor by the Deadline, which shall be determined in Sponsor’s sole discretion, Sponsor shall declare that Potential Winner is a winner (“Grand Prize Winner”). If an affidavit of eligibility and liability/publicity release, and any other required forms are not required by Sponsor, which shall be determined in Sponsor’s sole discretion, the Potential Winner will be named a Grand Prize Winner upon Sponsor’s receipt of the Information, if received by the Deadline. Sponsor is not responsible for any failure of delivery of the Prize Notification as described in herein. Return of any Prize Notification to Sponsor (e.g. email is undeliverable) will result in disqualification, and an alternate Potential Winner may be selected by Sponsor, in a random drawing from all remaining eligible entries received for the original drawing, if time permits. *Autographs have no added value. Approximate Retail Value (“ARV”) of all Grand Prizes: $249.99. 7. PRIZE CONDITIONS: Selection and specifics of the Grand Prize will be determined in the Sponsor’s sole discretion. The Grand Prize, or any part of the Grand Prize, is subject to availability and may not be awarded. No cash redemption or prize substitution allowed, except by the Sponsor, who reserves the right in its sole discretion to substitute cash value or another prize it believes is of equal or greater value. Autographs have no cash value. The Grand Prize is non-transferable. Odds of winning depend on the number of eligible Entries received. There is one Grand Prize. The Grand Prize is awarded “AS IS” and without WARRANTY OF ANY KIND, express or implied (including without limitation, any implied warranty of merchantability or fitness for a particular purpose). Acceptance, participation in and/or use of the Grand Prize is at Grand Prize Winner’s sole risk and Sponsor is not responsible for any damages whatsoever, including special, indirect, or consequential damages, arising out of or in connection with the use and/or misuse of any such prize. 8. TAXES AND COSTS RELATED TO THE PRIZES: All applicable taxes, including all federal, state, local and other taxes and any license, destination and delivery charges is the sole responsibility of the Grand Prize Winner. Grand Prize Winner may be issued a 1099 tax form for the ARV of their prizes and may be required to provide his/her tax payer ID number, social security number, and or other information for tax purposes where prize value requires it. Any additional expenses not included in the Grand Prize are the sole responsibility of the Grand Prize Winner. Noncompliance with any of these Official Rules may result in disqualification. By entering this Sweepstakes, entrants and Grand Prize Winner agrees to maintain a behavior in accordance with all applicable laws and generally accepted practices. Sponsor reserves the right at its sole discretion to disqualify any entrant or the Grand Prize Winner if his/her behavior is determined by Sponsor, is unsportsmanlike or is of disruptive manner, or with intent to annoy, abuse, threaten or harass any other person. 11. INTERNET/MOBILE: If for any reason the Sweepstakes is not capable of running as planned, including infection due to computer virus, bugs, tampering, unauthorized intervention, fraud, technical failure, including but not limited to failures of wireless, cellular, or Internet service providers, human error or any other causes beyond the control of Sponsor that corrupt or affect the administration, security, fairness, integrity, or proper conduct of the Sweepstakes, Sponsor reserves the right to disqualify any individual it finds who tampers with the entry process, operation of the Sweepstakes or Website, and to cancel, terminate, modify, or suspend the Sweepstakes without notice and to select the winner from all eligible Entries received prior to the cancellation or termination. Sponsor assumes no responsibility for any error, omission, interruption, deletion, defect or delay in operation or transmission, communications line failure, problems or technical malfunctions of any computer and mobile device online systems, servers, or providers, computer equipment, software, failure of any e-mail or Entry to be received by Sponsor on account of human error, technical problems or traffic congestion on the Internet or at any website, theft or destruction, or unauthorized access to, or tampering with or hacking of Website, any combination thereof, or otherwise, including any injury or damage to any entrant’s or any other person’s computer related to or resulting from participation in the Sweepstakes. 12. CAUTION: ANY ATTEMPT BY AN ENTRANT OR ANY OTHER INDIVIDUAL TO DELIBERATELY ALTER OR DAMAGE ANY ONLINE SERVICE OR WEBSITE OR TO UNDERMINE THE LEGITIMATE OPERATIONS OF THE SWEEPSTAKES MAY BE A VIOLATION OF CRIMINAL AND CIVIL LAWSAND SHOULD SUCH AN ATTEMPT BE MADE, SPONSOR RESERVES THE RIGHT TO SEEK DAMAGES FROM ANY SUCH PERSON TO THE FULLEST EXTENT PERMITTED BY LAW. 13. DISPUTES: Each entrant agrees that all issues, disputes and questions concerning the construction, validity, interpretation and enforceability of these Official Rules, or the rights and obligations of any entrant or the Sweepstakes Entities in connection with the Sweepstakes, shall be governed by and construed in accordance with the laws of the state of California, without giving effect to any choice of law or conflict of law rules or provisions that would cause the application of the laws of any jurisdiction other than the State of California. If any controversy or claim arising out of or relating to the Sweepstakes, the Official Rules, or the breach of any term hereof cannot be otherwise resolved, it must be submitted exclusively to binding arbitration conducted in the county of Los Angeles, and administered by Judicial Arbitration and Mediation Services (“JAMS”) in accordance with its Streamlined Arbitration Rules and Procedures or subsequent versions thereof (the “JAMS Rules”), except to the extent such rules conflict with the procedures set forth herein. The JAMS Rules are currently available at https://www.jamsadr.com/adr-rules-procedures/. The JAMS Rules for selection of an arbitrator shall be followed, except that the arbitrator shall be an experienced arbitrator licensed to practice law in California. The decision of the arbitrator shall be binding, final and conclusive and shall not be appealable to any court. The remedy for any claim shall be limited to actual out-of-pocket expenses incurred (if any), not to exceed one hundred dollars ($100), and in no event shall any party be entitled to recover punitive, exemplary, consequential or incidental damages, including attorneys’ fees or other such related costs of bringing a claim, or to rescind this agreement or seek injunctive or any other equitable relief, and entrant (or the entrant’s parent if entrant is a Minor) further waives all rights to have damages multiplied or increased. Notwithstanding the above, each entrant agrees that, to the maximum extent permitted by law, any disputes, claims and causes of action arising out of or connected with this Sweepstakes or the Grand Prize awarded or the determination of a Grand Prize Winner shall be resolved individually, without resort to any form of class action. 14. PUBLICITY: By accepting the Grand Prize, unless prohibited by law, Grand Prize Winner consents that Sponsor may use the Grand Prize Winner’s name, statements, photograph, likeness (including without limitation, his/her voice, biographical information, city and state of residence), statements concerning the Sweepstakes, or Sponsors’ products without further compensation or notice for purpose of Sponsor’s advertising, promotion, and merchandising purposes, without additional compensation or prior approval, and grant all rights to edit or modify and to publish and copyright it. 15. WINNERS LIST/OFFICIAL RULES: For a Winners List or a copy of the Official Rules, please send a self-addressed stamped envelope to: DC SUPER VILLAINS SWEEPSTAKES (2018) SWEEPSTAKES Winners List/Official Rules, 2900 W. Alameda Avenue, Burbank, CA 91505, to be received no later than 8/21/2018. BATMAN, HARLEY QUINN, DC Logo, trademarks, character names, and all related characters and elements © & ™ DC. This Sweepstakes is in no way sponsored, endorsed or administered by, or associated with LEGO, Twitter Inc., Facebook Inc., Instagram, and/or any other social media sites where this Sweepstakes may be promoted. Any questions, comments or complaints regarding the Sweepstakes should be directed to Sponsor at DCFans@dcentertainment.com and LEGO, Twitter Inc., Facebook Inc., Instagram, or any other social media sites where this Sweepstakes may be promoted. Reference to third parties in connection with the prizes and/or third party websites or services are for reference and identification purposes only and not intended to suggest endorsement, sponsorship or affiliation with Sponsor for the Sweepstakes.